Show off your bubbles in space NASA astronaut. I hope you enjoy this design as much as I did making it. Score one for the flat earth with this epic space bubbles design. This version has no text. 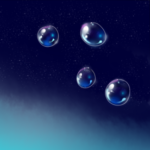 I designed another one that says “Bubbles IN Space” so look for that if you want it with text.